This piezo preamp is made for internal use and only comes as a preamp with no extra tone controls. The output signal can be mixed with another passive or active magnetic pickup, routed directly to a poweramp or another tone-control preamp. The unit has separate amplifiers and onboard volume controls for each string and one master volume. It´s available for any number of strings, starting with four. Only finest polyester capacitors with low tolerance and high linearity are used instead of ceramic and tantalum condensers in the signal path. We use excellent trim-pots from Bourns. The circuit is completely shielded and encapsulated. All produced circuits pass a final test and get a serial number for traceability. 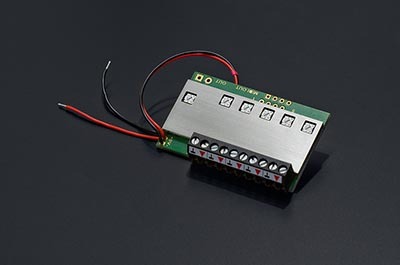 There are separate trim pots for each input/string and one main volume directly on the circuit board. The installation demands some soldering knowhow, since the piezo pickups have to be connected with the several inputs of the preamp. Installation and user manuals will soon follow.